I’m late with my blog post, but I managed to get up early to do it. I processed and uploaded some pictures, adding two pieces to the store, and then started on the blog post. That’s when I could no longer access the site. Oh, well… it is Wednesday at least. The week has brought several planned and necessary things, and a bit of the unexpected. Like hospital visits. Working on my mother’s computer. Then there were the planned. Getting the new and very expensive bridge started, an urgently needed haircut, a gallery opening in which I had two pieces, but forgot to go, and tah dah! setting up for the Holiday Open House in my friend Carolyn Bernard Young’s studio. The home of Earth to Art pottery. You can read about it on the home page and here. That’s Saturday. Then Sunday is the spice dinner. I’m doing the mango salsa, which should be fairly easy. One of the dishes this time is Peppercorn Ice Cream. Unfortunately, I won’t be tasting that. I gave up all sweeteners. That means no more Diet Cokes or ice cream. This entry was posted in Art, Personal, Tapestry on November 15, 2016 by Sherri. I decided to weave using mostly fall colors, but now I’m wondering, “What was I thinking?” Notice all those little pieces of yarn hanging around? Normally, I would needle-weave these in while it’s on the loom. There are millions of these little guys. It would take longer to weave them in than it took to weave this. Also, normally, I weave right side up, but I’m going to make an exception here. I had also thought to hang this vertically, thus using my usual method of hanging with a board and Velcro. That can’t happen with all those bits of yarn hanging around on the back. So, I guess I’ll have to build a frame, wrap canvas around it, and stitch this to the canvas with invisible stitches. Drat! says the lazy me. I was captured by this display as I left the grocery store. 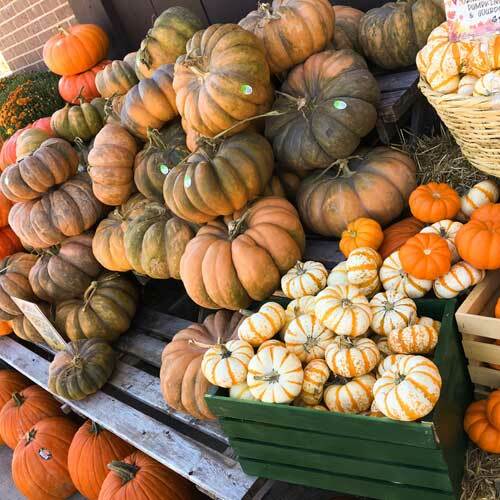 Love the colors of all these squashes, and others that are not in the image. Some of the colors are beautiful, even if they’re warty–lots of different shades of green and orange. 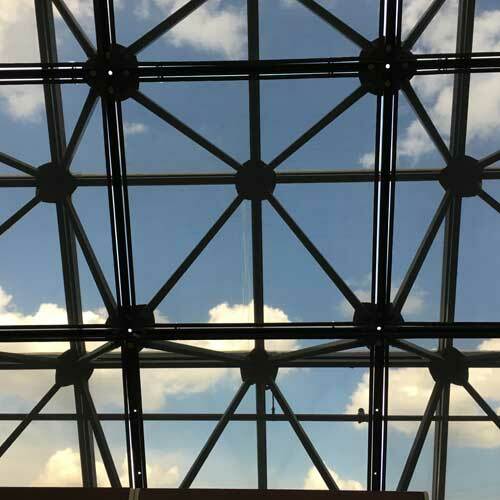 Had to visit my credit union last week, and I just had to get a pic of the clouds through this structural ceiling. I’ve always loved it, ever since they rebuilt after a tornado many years ago. My phone doesn’t do the whole roof/ceiling justice. Don’t you love the black lines against the blue of the sky and the soft white of the clouds? Since there seems to be a theme of fall here, I’ll move on to calendars. 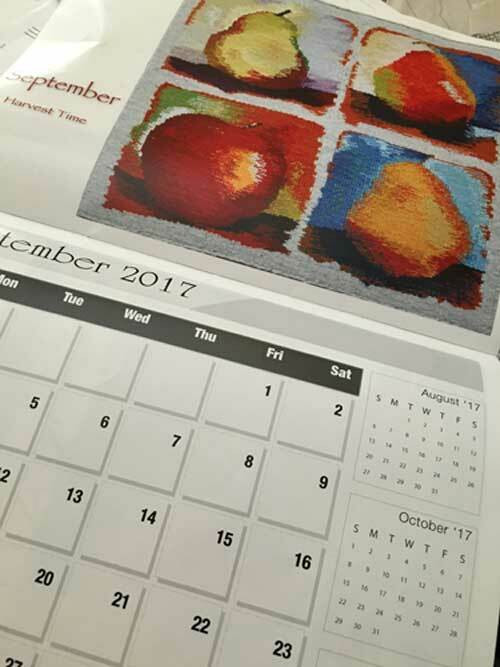 Have you seen Kathy Spoering’s calendar tapestries? She has put these tapestries into a calendar, which can be purchased from her Etsy store. 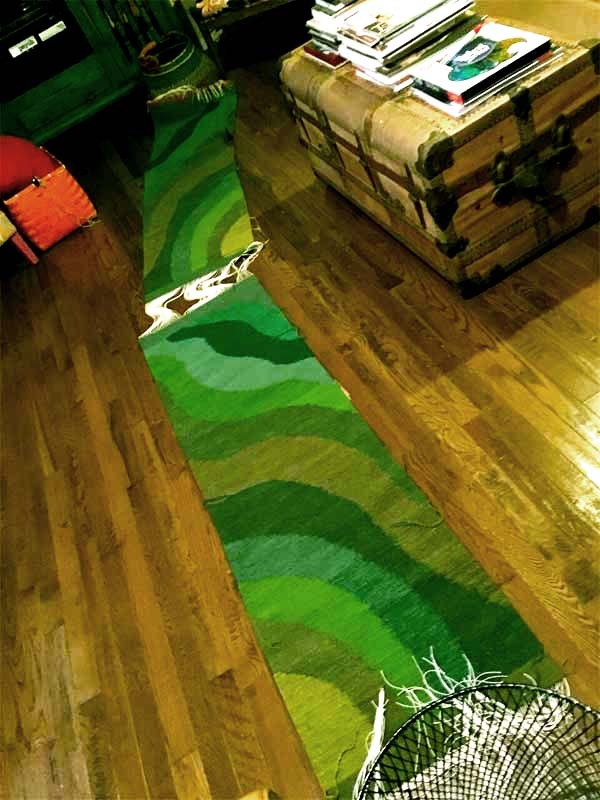 She started this series with her Four Seasons tapestries in 2003 and continued on to weave a tapestry for each month. I got mine last week! Isn’t it great! 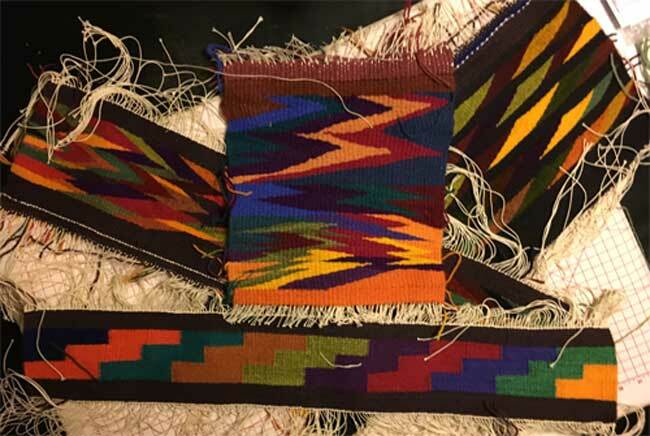 There are so many things that I have no desire to do weaving-wise–multi-shaft pattern weaving, pictorial tapestries–but I so admire the skill of the artist and the beauty of the finished work. Just like there are paintings that I would never choose to hang, but I admire the skill of the artist and the creativity in the work. I seem to be giving myself birthday presents this year. Of course, the best one of all is that I get to wait at the auto shop to get lots of high-mileage preventative things done to my car–NOT! Would rather have scheduled this for a time other than my birthday, but other days were full. Oh, well…. This entry was posted in Color, Tapestry, Weaving on September 21, 2016 by Sherri. I just have an inch of hem to complete before cutting this off the loom, It’s only 30 x 3 inches, totally spontaneous, until a pattern emerged. I’ve decided to weave another small piece next, using a mix of fall colors. Some will be my own hand-dyed yarn and others will be churro yarns from the Churro Club. 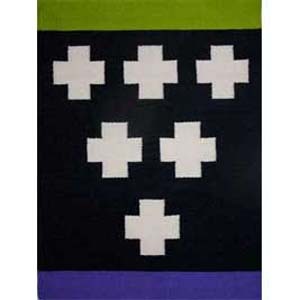 I think I’m going to weave it something like the piece below–if I can remember how I did it. In the never-ending search for organization, I’ve been trying a new method (for me) of keeping up with my calendar and tasks. Even though it’s so convenient to use my phone for appointments, I still like to use paper to keep up with my to-do list. Here’s where the bullet journal has entered my life, at least as an experiment. I dug out an old notebook to use for now, experimenting with adapting this idea for my use. So far, so good, but the usefulness of using any method is to review it daily, and that’s where I fall down and crash. If this works for me, I will buy a new journal for next year and start fresh again. Now, for a total non-sequitur–Well, maybe it doesn’t qualify for even that, because a non-sequitur usually has at least something to do with a previous statement–The blog post that has the most views is one from 2012 about cerise and fuchsia. Hmmm….how ’bout that! This entry was posted in Art, Personal, Tapestry and tagged Bullet Journal, Churro Club on September 14, 2016 by Sherri. What will be next for this warp? I don’t know, but it will hold something. 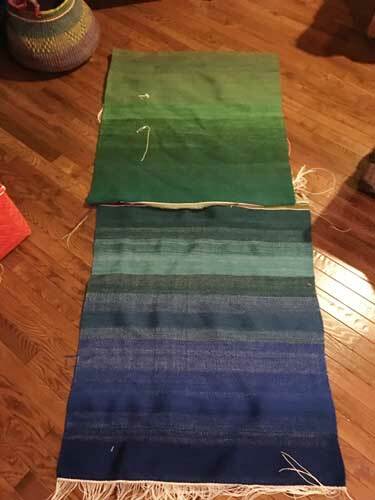 Before I can weave the “real” next project, wrapped yarn will be dyed, ikat ties unwrapped, rinsed, dried, and balled up. So, I will use some of the thousands of butterflies left from other projects and just start. 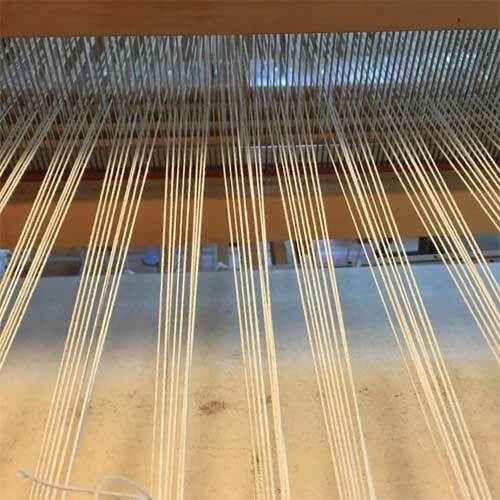 A warped loom must be used, or momentum will be lost. I have made a list of things that I want to accomplish each day, and am checking them off. A small step, but it seems to be a necessary one for me at this point. When I saw my father’s injury, I said to myself, “Oh my God.” Then I pushed myself to relax. I had been taught that if you panicked in life, you’d be ineffective and you couldn’t help anyone or yourself. My thoughts were about an eight year-old boy telling himself to be calm. I’m usually calm in an emergency, but I’m an adult, and frankly I wish I could use this mind control thing with everyday life. I admire people who do. Another quote below reminds me of a book review I read. Is it all about parenting? My parents weren’t in the habit of telling my younger sister, Mary, or me what to do. They encouraged us. They wanted me to become my own person. My 21st-century reaction reflects a very recent change in the way that we think about children, risk and learning. Ms. Gopnik references a paper by David Lancy, which can’t be accessed without the appropriate passwords, but he has written other articles that are accessible, plus a book. I’m probably not going any farther with this, but I do find this whole discussion interesting, maybe because it reinforces my opinion that my responsibility as a parent was to teach my children to be independent, responsible adults. What do you think? Yes, I know this has nothing with weaving or art, but it’s something to mull over while working on whatever the next project turns out to be. 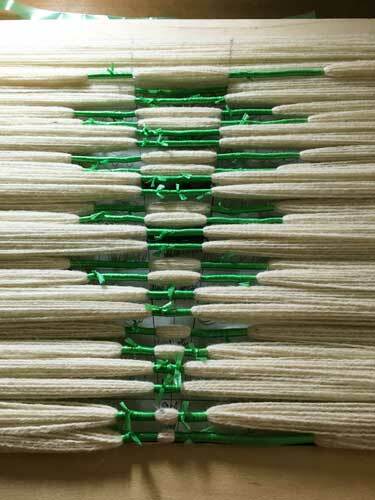 I went down a few rabbit holes, first via Pinterest, then to the follow-up of some weaving pins. eLoomaNation-This is about using those tiny pin looms, something that I thought I wanted to do, until I tried it. This entry was posted in Art, Personal, Tapestry on September 7, 2016 by Sherri. Other than the rain, there’s not much news around here. As I’ve said before, living in Texas, I hate to complain about rain. It hasn’t been that long ago that we were suffering a drought, but currently, we’re getting about an inch of rain–per day! And I’m one of the lucky ones. Other sections of Texas are flooding and people are dying. I can only imagine what they’re going through. The pieces above were cut off, strictly experimental with color. The bottom one has warp showing. I wanted to see how the color would shift with the white warp showing. Actually, the colors are pretty striking in person. I’ve decided that I like it enough to actually finish it, but therein likes the current problem. Since it’s not woven thickly like a tapestry or rug, I don’t know yet how it will look with a hem. Nothing to do but just try it. So, it’s steam-and-hem day, perfect for another rainy day. And below is what I’m working on with the ikat. See the design yet? After this piece, I think I’m going to do some of what I call freestyle ikat. New project, part of prairie series. What’s it going to be? This entry was posted in Art, Design, Ikat, Tapestry on June 1, 2016 by Sherri. The goal has been completed! It has been cut off the loom. (Green is not my favorite color, so I’m a bit conflicted about this.) Now comes the actual finishing, but for now it rests. Now comes the real life part of my existence. For the next two weeks, taxes must be done. That will be my major goal, obviously, but the brain just cannot do that all day, so there is other catching-up to do–mowing, weeding, planting, studio cleaning, life, etc. And yes, finishing this piece is on the agenda, but first I have to clean off the dining room table, my adjunct studio. That’s the place where the Crazy Monkey is residing for now, all my dye samples, and various other stuff relating to weaving and finishing. In the midst of all the things that have to get done, there are some things that are good for the soul. One is to have lunch with friends, also on the agenda this week. And weaving–I’ve tied on and started a couple of interim pieces until I have time to get to the “real” work I have in mind. I also made a trip to the big box store for lots of pipe and stuff to make a loom. This is something I started years ago, but walked away. More on that next time. And now for an image that makes me smile…this is my Kleenex box that sits on my end table. Every time I glance at it, I love it. 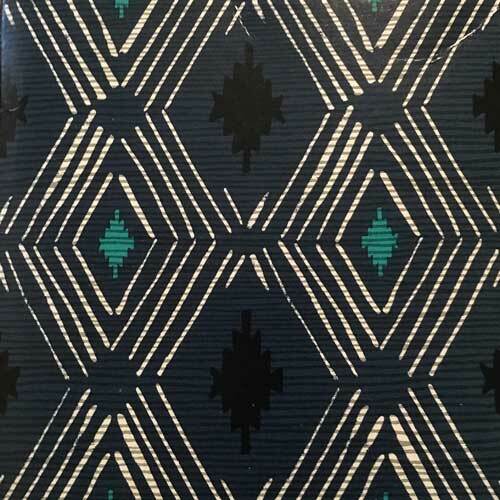 Maybe adapt this for ikat??? This entry was posted in Art, Personal, Process, Tapestry on April 6, 2016 by Sherri. Weaving for four hours per day does not leave me with very much to say, as I repeat myself. I did dye one more color to add to the others. The piece on the loom will be finished in about 10 inches. Then I get to do it again to make the second piece. Before starting on the second piece, I am going to weigh all the different colors, so that I can have an idea of how much I’ve used and know if any more dyeing needs to be done. I did dye one more color to add to the others. However, the pace will have to suffer a bit this week, as real life has a way of interfering. It’s spring and the grass weeds need mowing already and I want to plant a few things. At least I listened to another interesting book. The main character in Memory Man has two brain conditions, disadvantages of advantages, depending on one’s opinion. Actually, they might be called neurological phenomena. He has hyperthymesia and synesthesia. I’ve written about synesthesia before. It’s the phenomenon of seeing colors and letters in color, perhaps the number 3 is always blue, or vowels are green. Hyperthymesia is a new on for me. It is the condition of possessing an extremely detailed autobiographical memory. The character in the book, Amos, refers to it as the DVD in his head. He also said it’s a movie that he can’t get up and leave. Both of these conditions happened to him after an extremely hard hit while playing football. Amos is not a very likable character in the beginning of the book, but becomes more likable and interesting as the book continues. Maybe better with a suspension of belief. As it turns out, this is the first book in a series. The next one will be published in a few months. Obviously both of these conditions were interesting enough to me that I looked them up. After finishing the first parament and mow the weeds, there’s planting to do. The roses above arrived during all the rains we’ve had lately, and they’ve got to be planted. They’re bare root, something I’ve never handled before. I got them from Breck’s. Aren’t they pretty? 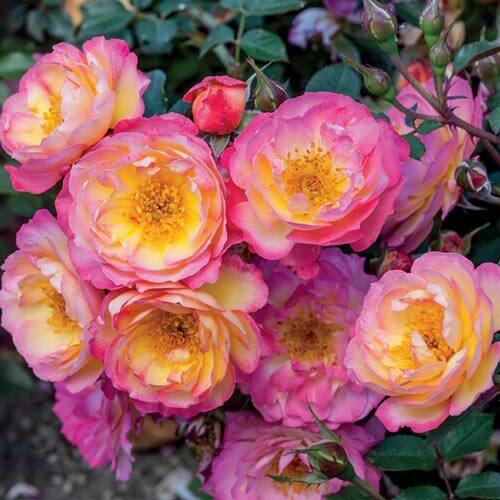 I read about them in Fine Gardening magazine. By the way, does your library have periodicals? Mine now has a huge selection of magazines, which probably means that I won’t be buying/subscribing as many. Not a bad deal. This entry was posted in Dyeing, Tapestry, Weaving and tagged hyperthymesia, memory man, synesthesia on March 16, 2016 by Sherri. The latest project is now halfway complete on piece one. 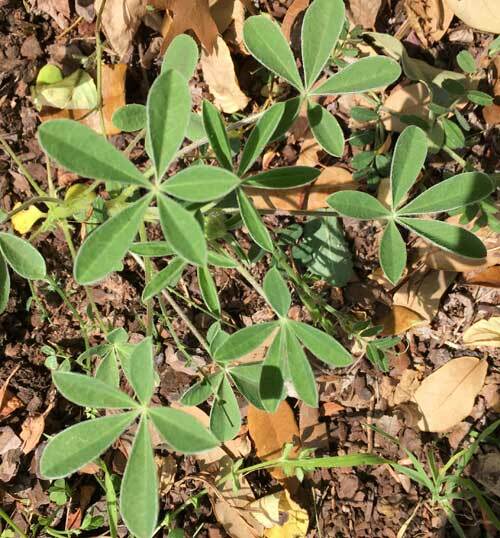 Since that’s pretty much all I have been doing, there’s really nothing to write about, unless you count the itty bitty bluebonnet plant I discovered while weeding. A couple of years ago, I threw out some wildflower seed balls that the boys and I made. Nothing happened the first year. Nothing happened the second year. But this year there is a bluebonnet plant, a lonely solitary plant. Making seed balls info can be found here and here. Besides listening to books, the idiosyncrasies in the color of the hand-dyed yarn keeps my attention while weaving. I noticed yesterday how different the colors looked between the singles and the plied yarns. These photos don’t really show the differences as distinct as they really are, but here they are anyway. The plied yarns are very tightly twisted and have a great sheen to them, so the differences might be because of light reflection, but I think it’s based on how they take up the color. 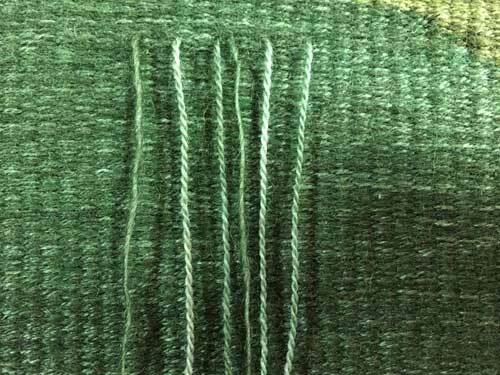 Even if you cant tell from the yarns hanging out before being needle woven in, you can see in the woven portion that there are varying shades. 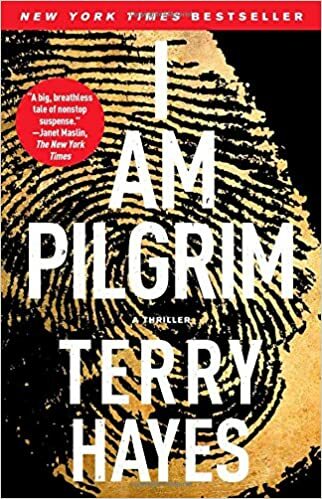 About the book—I am listening to I Am Pilgrim by Terry Hayes. At first I thought this book is not going to do. It’s slow to really get started, but as I listened, the action got faster and faster, and I wove faster and faster. Funny how that works. It’s a spy thriller, and it’s very long. The audio is divided into three parts. Most of the books I listen to are divided into two parts. By the way, I’m trying very hard to update the blog at least once per week, most likely on Wednesdays. That doesn’t mean I won’t have a brainstorm or just be brimming with all kinds of weaverly or personal stuff on other days. 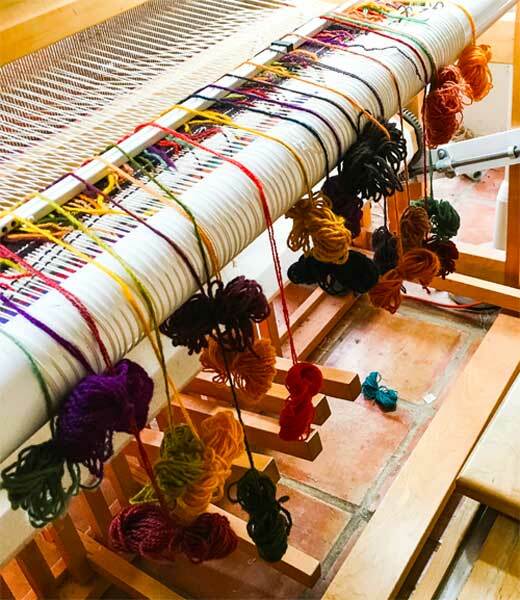 Some days/weeks there’s lots to say, but when I am at the loom all day for days, well, there’s only so much to say about that. This entry was posted in Art, Books, Color, Tapestry, Weaving and tagged bluebonnet, I am pilgrim on March 9, 2016 by Sherri. Have you ever spent a day balling up skeins of yarn? Except for the tangles in the new yarn I’m trying, a pretty boring experience. I tried doing it while listening to a book. Works most of the time, but then the squirrel cage gets to going so fast that it rattles noisily and I can’t hear the audio. And about those tangles…all that glorious kinkle that I wrote about earlier, just doesn’t seem to want to disappear, no matter how many times I pop those skeins. I start winding and all of a sudden, my winding yarn is under another strand and just won’t release. So, I cut and tie and move on. Until the next time, which means that balling up 27 skeins of yarn took a looooong time. Now, those skeins that I wound myself? Perfect. Even though they are with a singles wool, perfect. Love my skein winder. Here’s the weaving so far. Sorry about the head shadow, but at least I caught that I took a picture of my thumb! You can barely see the new color I just started on the right. 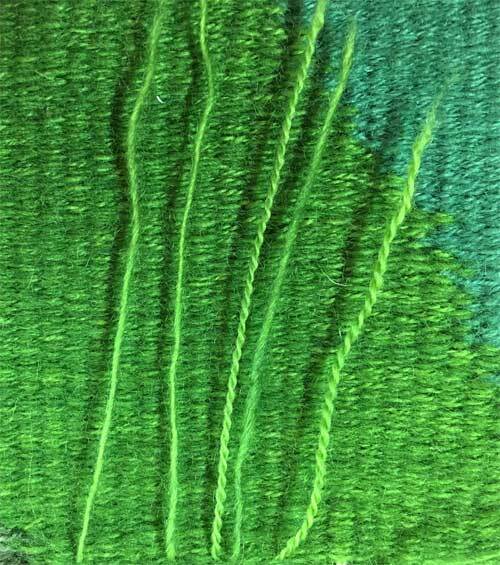 Now my fear is that all these greens, although they look so distinct in balls, won’t look that way in the final weaving. Gotta have something to worry about, right? I’m curious — How many of you belong to a guild of artists/artisans? Weavers, potters, painters, quilters, etc? Do you belong to a group that meets and has programs? Do you have a guild sale? 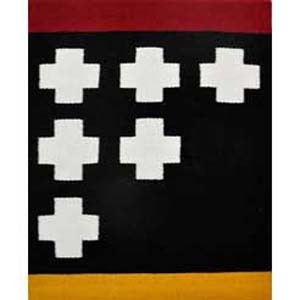 My guild, Fort Worth Weavers Guild, has finally obtained non-profit status and we are now allowed to have a sale again. We used to have a sale along with our biennial show, but the lack of non-profit status and the state sales process caused us to stop. We’re back! We will have our first-sale-in-a-long time April 27. But for now, I’d like to know about public events your guild/group has. Shows? Sales? How do you plan it? Carry it out? Share and maybe inspire and/or help all of us. 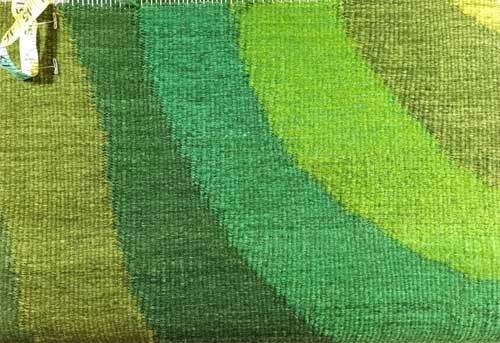 This entry was posted in Color, Dyeing, Tapestry, Tools, Weaving on March 2, 2016 by Sherri. As I write this, key wat is simmering on the stove, part of the spice-of the-month-dinner for this month. Yes, it was really for November, but we’re behind. I’ve written about these dinners before. I’m also attempting to make injera, not with great success though. It fermented well, but the cooking is a problem. I can’t seem to do what the recipe said. Update: We ate the injera, which is not much in itself, but really fermented. It really went well with the spicy beef stew I made (key wat) and the spicy lentils and rice dish my sister made. 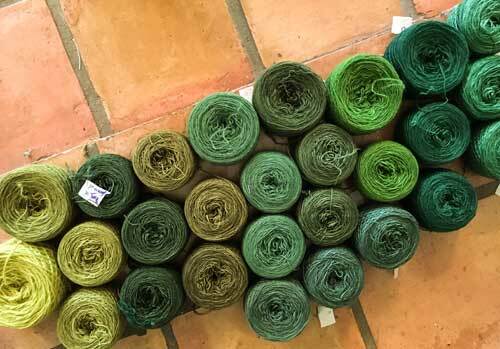 I’ve also been organizing (kind of) the greens I may use for a commission. 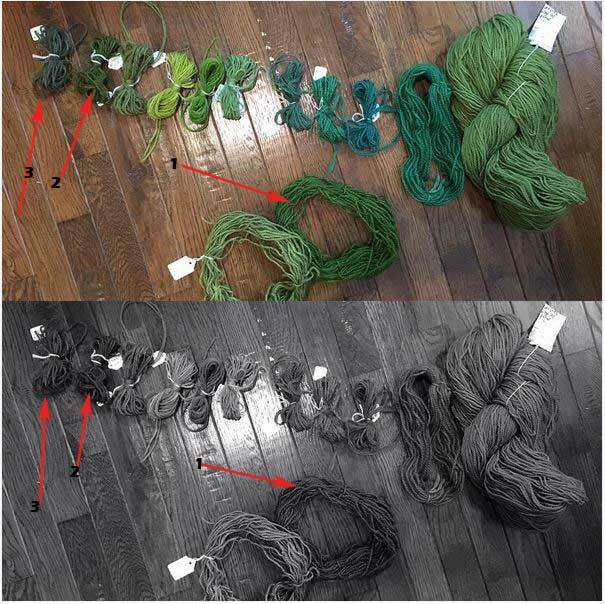 I labeled each sample with the dye formula, hoping to simplify the process a bit when it’s time to weave. I will be using different yarns for this projects, as it needs to be thinner and more flexible. 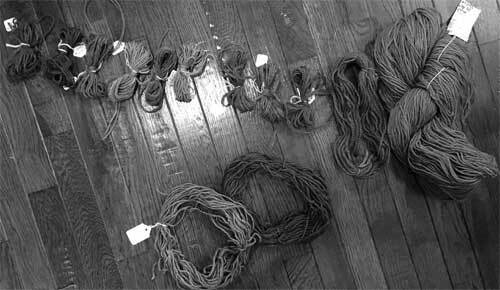 Since I had these yarns all laid out, I decided to change the picture to black and white, just to see the values. It’s interesting to see those sometimes–there’s nearly always a surprise. From looking at this grouping, which do you think will be the darkest? The lightest? Here the two pictures are combined. I’ve written and drawn on the picture to show which ones surprised me a bit. 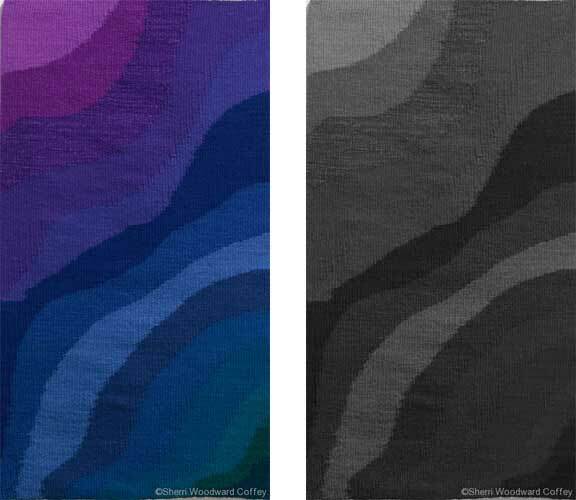 It’s also interesting that several of the colors are so close in value, although very distinctive in their color form. The same is true for this piece. Some of the grays are so close together that they are hard to distinguish, especially in the lower right section, yet they work. If I had been working with gray scale, I might have woven something completely different–or not. 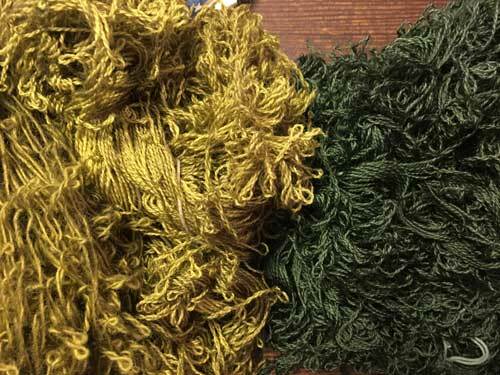 I haven’t decide which greens will be used yet, so the color order is also not decided. After the colors have been decided, I will dye all the yarns, then lay them on the floor and make decisions. Of course, there will also be colors in between the skein colors, as some of the colors will be combined to make new colors. That’s the beauty of weaving, right? Do you pay attention to gray scale? How do you use it? This entry was posted in Art, Design, Dyeing, Tapestry, Weaving and tagged grayscale on February 3, 2016 by Sherri.